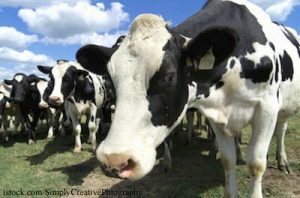 The Washington State Department of Agriculture (WSDA) is investigating a case of bovine tuberculosis in a dairy cow. The cow was sent to Cowlitz County facility for slaughter, but the meat was held after an inspector thought there was a problem. This is the first time bovine TB has been found in the state in 25 years. Public health officials say there is no immediate health concern because the meat was isolated until test results were received. Bovine TB is contagious among cattle and can cause tuberculosis in people. The Grant County dairy farm where the cow lived pasteurizes its milk, so there was no risk to the public consuming it. A USDA Food Safety and Inspection Service inspector noticed a “suspicious lesion” on the animal on January 8, 2013 and sent a sample to the National Veterinary Services Laboratory (NVSL) in Iowa. The lab reported that the sample was consistent with bovine TB on January 16, 2013. The WSDA has issued an order preventing the dairy in question from moving any of its cows, and directing that all milk and milk products produced there are pasteurized. A bovine TB eradication campaign began in 1917 in the United States and has almost eliminated the disease. There have been sporadic cases, such as this one, since then. Washington cattle have been TB-free since 1988.